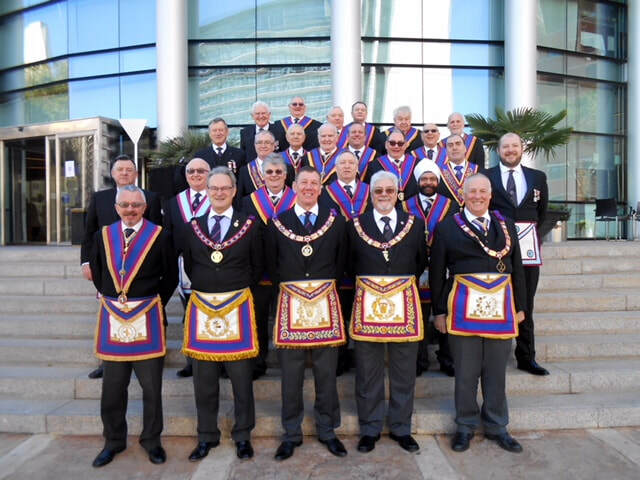 Following last year's successful second visit (the sequel), members of The Province of Essex again attended the District Meeting of Spain, held in Benidorm, in early February. The Provincial Grand Master lead a party of twenty five Essex Mark Men to the District Meeting, accompanied by R.W.Bro. Eddy Garty, the PGM for Middlesex and one of his APGMs W.Bro. Steve Vanhinsbergh, who are both members of Essex Mark Lodges as well. Braving the chilly, early morning start they boarded the airplane with a sense of anticipation. After arriving on Friday, when what was described as "some" time spent exploring the local tapas bars, the intrepid bunch retired to the hotel bar before retiring for the night (some of the relevant photos can be seen on our Facebook page). Saturday morning saw the District meeting take place with over 300 Mark Master Masons attending, not only from Spain, but from many English Provinces as well. The meeting is conducted both in Spanish and English and included the Investiture of District Officers as well as first appointments and promotions. The meeting was followed by an excellent festive board accompanied by "some" excellent local wine. As ever, a very warm welcome was extended to all with the members of the District of Spain always delighted to receive visitors from the United Kingdom. The party also took the opportunity to visit W.Bro Martin Lynch, an Essex Mason, who has a bar(sense a theme here?) in Benidorm and laid on a tapas evening for their enjoyment. The District of Spain, is one of those "Districts and Lodges Overseas" and further details can be found on their website if you are travelling or visiting Spain and want to make the most of your time. Visit www.districtmarkspain.com for more information.